PHOENIX – As one of the nation’s “Best Communities for Music Education,” a distinction awarded by the National Association of Music Merchants, students in the Phoenix Central School District lived up to the hype during several concerts in March. Michael A. Maroun fourth graders sing the district’s alma mater during a recent concert. 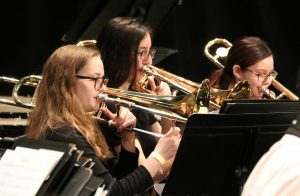 The district’s music department celebrated Music in Our Schools Month at each level, from elementary through high school, as students showcased their vocal and instrumental talents for audiences of friends and family members. 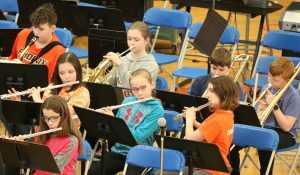 A standing-room-only crowd filled the Emerson J. Dillon Middle School gymnasium March 14 as students in fifth through eighth grades performed a full lineup of songs. Emerson J. Dillon Middle School student musicians perform during a concert for their classmates. 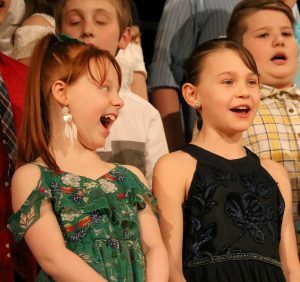 The following week, the high school auditorium was packed as fourth graders sang under the direction of Jody Lentz. To wrap up Music in Our Schools Month on March 27, John C. Birdlebough High School musicians delighted the audience with nearly a dozen songs. The school’s Symphonic Winds ensemble, the Firebird Concert Chorus and the Chamber Singers each performed a handful of songs. The Symphonic Winds take the stage and perform “Exhilaration” as the opening number during the high school’s spring concert.